First, check out my free SAT e-book, Master the SAT by Brian McElroy, and r/SATACTprep, a "subreddit" I have created on the Reddit website to easily share free SAT and ACT information. Step 1: Take a practice test to determine your baseline score. You can find 8 free, official practice SATs, along with answer explanations, on the College Board / Khan Academy websites (make sure to print them out before you take them). Or, simply buy the paper book instead. The entire test -- Reading, Writing and Language, Math No Calculator, Math With Calculator, and Essay (optional, but required by many colleges)--takes around 4 hours and should be taken all at once, if possible, or split into a maximum of two parts. Already ran out of the first 8 tests? You can find more official SATs here (scroll down on the right-hand column). Step 2: Set a score goal. My students' score improvements on the new SAT (400-1600 scale) are about 150-200 points. Step 3: Start working on the content of the test. UPDATE, JULY 2018: My Top 11 SAT Prep Resources, Ranked. If you are looking for an online SAT self-study program that tracks your strengths and weaknesses (similar to Khan Academy), then I can suggest UWorld, which is free for 3 months with this code. For additional help, consider a private tutor like me who can point you in the right direction. Real SAT questions are of course always better to practice with, but for the new SAT, they are currently in short supply. So you should also download and take PSAT Practice Tests #1 and #2. Professional SAT tutors like me will obsessively collect every real SAT or PSAT we can find, and at the moment, there are very few of them (17 total), so of course they are especially precious. You can also find free SAT Prep Tips on the McElroy Tutoring Blog and free SAT videos on the McElroy Tutoring YouTube page. You should also subscribe to the SAT Question of the Day. In addition, keep reading challenging material, such as the Top 100 Fiction and Top 100 Non-Fiction titles on Amazon. Also check out literary websites such as The Atlantic, The New Yorker, The Economist, and even Grantland for the sports fans. Step 4: (only recommended for lower-scoring students): take an SAT classroom course such as the one at UCSD, where I am currently on the teaching staff. These types of classes can be helpful for low scorers who need all the time, practice and repetition they can get. But don't overpay for an "elite" class: these types of classes are all very similar and focus mostly on test content and basic strategies for the average student. Instead, save your money for a qualified private tutor later on in the process. 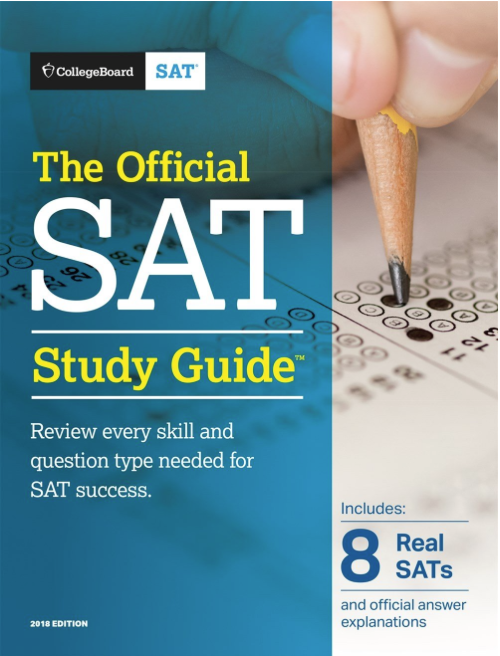 Step 5: If you haven't done so already, buy 2 copies of the Official SAT Study Guide (I recommend keeping a second, blank copy for the purpose of reviewing questions without bias), and buy a good graphing calculator if you don't have one already. Or, even easier (and possibly cheaper): just go to the College Board website, download those same 8 PDFs for free, and simply print them out at home. The drawbacks to this method are that the pages will be harder to organize, and that you will incur printing and paper costs. Step 6: Once you begin studying, consider scheduling some time with me or another private tutor. You may meet with your tutor for anywhere from 1 hour to 100 hours, but most students need at least 15-25 hours for a full preparation. If you are willing to go with the Skype tutoring option, then you are free to choose from any tutor nationwide. I recommend scheduling a 15-minute phone consultation with me or your tutor before the first lesson, to discuss timelines, scheduling, and the unique needs of the student(s). As a general rule, students should spend at least one hour on homework for every hour they spend with their tutor. The usual homework assignment is 3-4 sections from the book (approximately 1.5 hours), working from the front to the back. Students should time themselves, and mark the question where they run out of time, but continue working past the time limit if necessary. Full practice tests should also be taken periodically, at the discretion of the tutor. The goal is to eventually complete all 10 tests in the book, and possibly more. Either don't grade your homework and just let your tutor grade it for you, or grade it yourself (the answers are in the back), but please do not indicate the correct answers anywhere on the test. Remember, when you take the SAT, you do not know the answer to the questions in advance. As tutors, we must preserve this unsure feeling on behalf of our students, or much of the value of the question is lost. In the same vein, when a question is tried again, it is best not to know the correct answer, or one's previous answer. This is where the second, blank copy of the book comes in. Step 7: If you haven't done so already, then register for the SAT. The SAT is administered 7 times a year, on varying days: October, November, December, January, March, May, and June. Three times a year, the SAT offers what's called the Question and Answer service (QAS), which allows you to view the actual test questions as well your answers (you will be mailed a physical copy of the test booklet about 5-6 weeks after the test). Sign up for the QAS service in advance if you can--it costs extra but it's worth it. Currently it's offered in October, January and May. These are the best three months to take the test, because otherwise there will no way to review incorrectly answered questions with your tutor afterward. Step 8: Take at least 2-3 full practice tests in the weeks leading up to the real thing to make sure your score is where you need it to be. Step 9: On the morning of the test, read my SAT test-day tips for a final time. Step 10: Repeat if necessary. Most students score highest the second or third time they take the SAT. You may also find helpful information in my Grades 9-12 document.